Watching your baby walk for the first time is indeed a very glorious and amazing moment. Looking at them might even want to make you cry, laugh, or squeal with joy. You now realize that parenting becomes more of a challenge since a walking baby needs a lot more attention. No parent will ever want their babies to fall down or bump themselves on the floor, a table, or a wall. At the same time, parenting also becomes easier because babies can go and get themselves to somewhere they want to go without relying on you – still with your eyes on them, of course. Next thing you think about? Baby walking shoes! Once your precious little babies have already gotten a grip and mastered the art of walking, you can now be comfortable with taking them for a walk outside the house. After taking in that monumental milestone, you imagine and think of the many walks and fun adventures you’ll finally be taking together. You feel all giddy and excited about buying them good pairs of baby walking shoes. Despite all the excitement, the safety of your precious ones’ walking experience will always be your top priority. Your kids’ safety will start with picking the right walking shoes. The perfect walking shoes will keep those tiny feet safe and protect them from any hard, rough, and unsafe terrains. If you’re still confused on which walking shoe will work for your baby, don’t worry cause we are here to guide and help you. This article will feature the best baby walking shoes and some great tips on getting the walking started. Stride Rite has been a part of every baby’s walking journey. Parents really love how these shoes are so good-looking without compromising function and comfort. Stride Rite has been known to greatly help babies in developing steady steps and good balance. The Elliot shoe is elegantly designed and parents love how this shoe looks really crisp and clean. One buyer said, “I love love love these shoes! They are the classic baby walkers that parents have used for over a century! There’s a reason these shoes are so popular, and I definitely recommend them to all toddler parents! These are nice and sturdy and have a nice grip. As long as my toddler is wearing these, there are no falls.” That would mean Stride Rite has been doing really great for keeping babies’ feet safe and steady. The shoes are made of breathable upper leather to let those little feet breathe. It has also a textile lining that wicks moisture. The footbed is made of self-molding textile with a contoured heel cradle to ensure a secure and comfortable fit. Stride Rite is known for its SRT that helps imitate barefoot stride through sensory pods on the outsole to help children feel the ground. Its super flexible outsole of these shoes helps your little ones adapt to uneven pavements and floors. This shoe is super flexible therefore it will not hinder natural foot development and movement. These walking shoes have been a staple in every kid’s wardrobe for over a decade. Made with a very classic and formal style, these shoes are a hit even for the parents’ taste. A very pleased buyer said, “These shoes fit well and look great; my son is complemented on them often. They look exactly like the picture. Overall I am very pleased with this purchase.” and others express how good these shoes look when worn by their little ones. 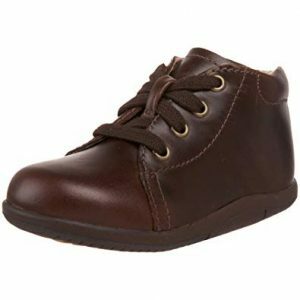 The Josmo unisex walking shoe is a structured leather bootie with a flat bottom that corrects and supports kids walking gait. They are made of high quality and premium leather that is very durable but breathable and comfortable at the same time. These Josmo walking shoes are available in medium and wider sizes to accommodate chubbier baby feet. Pediped shoes are approved by the American Podiatric Medical Association for promoting healthy foot development. These ultra lightweight shoes are made of synthetic materials with no animal products or by-products. The lining of this sporty shoe is a breathable mesh that is very comfortable for your kids’ tiny feet. It has all natural and phylon sole that has a magnificent grip preventing slips and slides. Pediped features G2 Technology that is specifically made for kids who are developing from early walks to stepping in a more stable manner. For over 30 years, Kenneth Cole has been producing high-quality shoes and clothes. And now they have made a line for kids so that your little boys can look a lot like daddy. Mommy’s love how this pair looks like a mini version of the adult ones. One mom have expressed her feelings on how lovely her son looked wearing this high-quality pair. Her little kid loves wearing it all the time because they are comfy and very much good-looking. She also loves how this baby walking shoes look so much like the adult version. You can let your child look super savvy and classy without them complaining about ouchie feet since these Kenneth Cole loafers are super comfortable and your little boys will surely love them. These shoes come in a bit wide so they’ll be great for the little darlings with chubby feet. This pair looks so chic and cute that surely your baby girl will love to wear it all day. They are made of soft and breathable leather that is perfect for those tiny and sweaty feet. This pretty little pair features a simple design that is classy and super playful as well. The rubber outsoles of these shoes are super flexible and the insoles are breathable. A satisfied mom said, “I love these shoes. These are the perfect first baby walking shoe. I bought these full price is every size, and these have been my babies main shoes.” The Livie & Luca Petal shoes are also easy to pull off and on, just right for little hands! “Cutest sneaks ever. So comfy and soft and my little guy runs and jumps like a champ in them.” These athletic baby walking shoes will work great for the energetic and active kids out there. This is a Stride Rite styled sneaker, the leather Artie has another closure for convenience in wearing the shoe, fancy decor laces for a real-sneaker appearance, with a memory foam interior. Stride Rite is known for its SRT or Sensory Response Technology that aids to imitate barefoot walking through the sensory pods on the outsole to help kids feel the ground. It has grooves that are deep to enable comfortable mobility and natural leather linings for ease and breathability. These shoes can be bought in medium and wide widths for those tiny chubby feet. The soles are non-slip and are made from suede and allow feet to grip as they begin to walk and room to grow. These shoes are non-constricting to continually develop good balance and remarkable growth and development while being able to provide safety to tiny little feet. The insides of the shoes are roomy enough to fit in with a range of different sizes for tiny fir that grows. Additionally, they have an elastic ankle strap makes this baby shoe easy to wear and stay on. The soft soles flex and bend with every baby step. For over 30 years, Melissa has been focused on bringing comfort and design with pretty-looking jelly shoes. These adorable baby walking shoes are perfect even for the rainy season! These sneakers by Melissa channels a very cute and sporty aura for your babies. It is made with suede sole that are very flexible so that your little girls will not easily slip. The upper material is made from 100% recyclable plastic and comes in bright colored variants and a glittery one too. These cute and fun-looking sandals are perfect to match with your little boy’s khakis and summer shorts. The Ross sandal works great for those little kids who are starting to walk. They feature leather soles that are very durable and super flexible as well. This pair by Pediped boats the updated diamond leather tread that is more slip resistant. They are made of non-toxic leather with a design that allows tiny toes to move and promote better grip. The lining of these sandals are breathable and allows good airflow for maximum feet comfort. Like any other Pediped shoes, these are approved by the American Podiatric Medical Association for promoting healthy foot development. The sneakers from converse have been one of the staple shoes in every household. Who would not want to see a cute little baby wearing one right? These look very much the same as the adult ones so you and your babies can go out and take Instagram-worthy OOTDs in matching white chucks. And that would be totally adorable! When it comes to comfort, there is no question about how comfortable these sneakers can be. They are made from canvas and rubber sole that won’t easily slip. The sole might not be that super flexible but with the right breaking in and bending, your little ones will do just fine. This pair is totally perfect for your rugged and stylish little guys. The mini version of the famous shoes is made with soft textile lining so that little feet can feel comfortable. The perforated three stripes contribute to the shoes’ breathability and good airflow. The shoe comes with a non-slip rubber sole and comfort closure straps so that it can easily go on and off of your kid’s tiny feet. With this pair of shoes, you can also go matchy-matchy with mom and dad since they have an adult version of this shoes too! Understanding the anatomy of a baby’s shoe is a crucial step towards choosing the correct shoe for their child. According to McPhoil, the structure of a shoe can be divided into two parts: an upper and bottom part. Toe box – the area that the toes fit into; it should provide enough space for the baby’s healthy foot development. Insole – the added padding inserted into the bottom of the shoe; it is best if they have odor control and anti-bacterial properties. Lining – the covering for the inside of the shoe; it should provide comfort and allow airflow so that the feet can breathe. The lining should not be a medium for those tiny little feet to sweat more than they already do. Sole – the bottom layer of the shoe; it should be flexible, durable and has a good grip. Heel – the rear part of the bottom layer of the shoe; it should provide shock absorption to the child’s feet to avoid injuries and discomfort. Heel stabilizer – the part that forms the heel; it should provide additional support to the child’s ankles and feet while walking. The tips from the AAP are very specific and they incline towards your babies’ health, safety, and proper feet development. Walking shoes should be lightweight and flexible to support natural foot movement and will not hinder foot development. Preferred materials include soft leather, mesh or cloth to allow those tiny feet to breathe and be comfortable. Shoes should be safe, non-sleep, and has good traction to prevent scary slips and slides. At home, it is okay for the babies to go walking on barefoot to promote natural foot development. Another reason is that children learn to walk by their toe movements, their toes grip on the ground and they do not need arch support. Going barefoot lets their tiny toes move and develop their walking skills. When surfaces are uneven, rocky, hot, or cold, shoes should always be worn to protect those tiny feet from scratches or blisters. Baby walking shoes are different from the shoes that we usually wear. They are also a bit different from the shoes your babies have been wearing when they were not still able to get up. They used to wear those crib shoes that are extremely soft and cushiony, often crocheted and may look a lot like socks or fluffy slippers. Now, these baby walking shoes are the next level version of their crocheted and super soft ones. These type of shoes will have a good grip, have rubber and more compact soles. The baby walking shoes will also have a lot more when it comes to ankle support but they are still soft and flexible. Their main role and purpose are to protect the babies’ feet outdoors or any surface that could be dangerous. 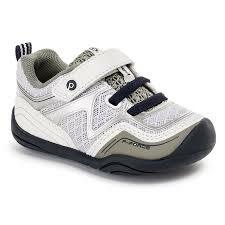 Good baby walking shoes are those that are sturdy and able to provide good ankle support. They should also have soles that are thick enough to protect those tiny little feet. These baby walking shoes, despite all the support and thickness, should also be totally flexible to encourage natural feet movement and development. Non-skid or non-slip soles are also perfect for unwanted slips and soles, also to give babies more safety and confidence when walking. Baby walking shoes, similar to toddler rain boots or snow boots should be perfectly sized for maximum comfort. The Society of Chiropodists and Podiatrists recommend that a new shoe should be approximately 12-16mm longer than the longest toe. We know how uncomfortable shoes that are too tight can be and we never would want out babies to feel the discomfort. Getting them walking shoes that are too tight will result in painful blisters and cramping toes. The babies will never like that so you have to make sure that they get to wear just the perfect size. Make sure you have your baby’s feet accurately measured before you start shopping. You need to take note of the width and length as well. Taking the measurements will be best during the afternoon and night. Measurements taken first thing in the morning are slightly smaller but will still matter. Getting a home shoe sizer will be a good investment and a great help, try Squatchi. The quality of the material is a very important consideration in buying baby shoes. 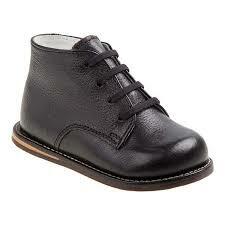 Look for a high-quality soft leather, mesh, or cloth- topped walking shoes for baby. The material for your baby’s first walking shoes should allow airflow. This is to allow those tiny feet to breathe and be comfortable since babies feet tend to sweat a lot more compared to adults. You do not want your baby’s feet to be all super sweaty, right? Not only that it will be super uncomfortable for your kids, but it will also result in smelly feet that are also prone to fungal infections. The material should also be flexible enough to allow the movement of those tiny toes. Stiff shoes will hinder the development and growth of your baby’s feet and it may feel pain too. To see if you are got a flexible shoe, bend the shoe at the flex point and near the toe area. The shoes should flex and bend easily with little to no resistance. It is important that even with shoes, babies will be able to naturally flex their feet in order to master the art of walking. Flexibility is determined mainly by the outsole, but flexible soft upper materials as mentioned above are also very important. Baby shoes and their other everyday stuff and clothes should always be lightweight. No matter how pretty or fab the design is, if it is heavy, do not buy it for your baby. Always avoid heavy and bulky shoes since it will only strain your babies and might even result in painful legs and ouchie feet. When it comes to style, parents mainly think about the color and design of the shoe they’re getting. But what we really mean by style here is velcro, lace, straps, and slip-on. We all know velcro gets an A in this since these fasteners make it easier for the shoes to get on and off without fumbling over laces. But with velcro, a child can figure it out easily, and they may tend to start taking off their little shoes in places and during occasions, they’re not supposed to. If you choose to get laces to make sure they are long enough to be tied into a double knot to ensure a snug fit. It is important that shoelaces should not easily come undone to avoid tripping over them. Whether you go for velcro, straps or laces, always make sure that they’re supporting your baby’s position in the shoe. Good support will ensure that they would not have to curl their toes to keep the shoes on properly. The opening or the foot entry of the shoe should also be wide enough to allow easy and proper placement of those tiny feet inside the shoe. Brand new baby shoes can be really pricey especially if they are of really good quality. You may also tend to be spending more since you might need to replace them every couple of months or so. But try to resist the urge to getting preloved or second-hand shoes while your babies are still in their first part of the walking adventure. In this stage they are still trying to learn more and discover about walking, running and jumping. And a brand new shoe will be best! “New shoes will adapt your child’s growing and developing foot,” says Dr. Tanya Altmann. No two feet are the same, and buying something new ensures that the inside isn’t molded to someone else’s foot. You get to avoid possible fungal infections and smelly feet situation from the previous owner too. Baby walking shoes should have rubber or leather soles to grip the ground. It will give your baby more traction as she begins taking those first wobbly and unsure steps. Choose those shoes that are non slip to help them to be steady on their feet while they walk. It will also help you be confident that your babies will not slip and slide easily when walking. Redness and bruises on the skin: Look for redness or rashes between toes, around the arches and ankles or any lumps on the soles of feet. Nail problems: Look out for any inflammation or discoloration of toenails. Deformed toes: Make sure toes are always in a straight line with the foot and not curled back. It’s normal for the fifth toe to tuck under the fourth toe, or the fourth toe to tuck under the third, but make sure the big toes are straight. Posture: Watch out if your child’s feet look excessively turned in or out.